Paul French has long been one of the known writer and researcher on today’s China. Besides his business writing and advisory, he is clearly fascinated by Old Shanghai and the Republican period, having published several books on the topic including Carl Crow’s biography “A tough old China hand”. His blog www.chinarhyming.com has numerous followers, he is also a regular speaker of the Shanghai Literary festival. One of his latest published book is “The Old Shanghai A-Z”. Today’s Shanghai fast growth creates many direction problems, with roads and motorways being built where only fields existed a few months before. New districts in Xing Pu and Minhang districts as well as Pudong are a constant puzzle for taxi drivers. Places far away or unheard of a few years ago have transformed into concrete jungle and then been infused with life thanks to the arrival of a new shopping center or entertainment area. When I first arrived in Shanghai in 1998, few people had thought about going out in places like GuBei, South Bund or Pudong. The Gubei Bar Street, Coold Docks and Thumb Plaza are now thriving places for entertainment. The rapid development of Old Shanghai was very similar to today’s one. As an example, a battle was fought in 1854 on an empty muddy plain that is now People Square. Similarly the new Shanghai General hospital was built in a “Very far area” on the other side of Suzhou Creek. I really like the American Express guide for “Sightseeing in and around Shanghai”, mentioning SheShan as a 1 to 2 days trip, when it is now a stop on the Shanghai Metro line Number 9. Just like orientation in today’s Shanghai, this creates a problem in tracing adresses in Old Shanghai. Furthermore, political changes have resulted in several changes of the street names over the year. Names in English and French of the International Settlements have been changed to Chinese names. Sometimes the original Chinese name translated from the foreign one was kept (like Sinan Lu, or GaoAn Lu), or translating the original meaning (like ZhongHua lu and Renmin Lu, the former “Boulevard des deux Républiques). Most often a brand new has been introduced, to follow the political fashion of the time. This is the case of Huai Hai lu (the battle between Communists and Nationalists) or Yannan lu (the hideout of Mao Ze Dong in the 1930’s). In any case, finding the current location of an old Shanghai address is often not easy, this is where Paul French new book is just what was needed. Although lists of Old Shanghai streets existed, I had never seen a complete one before. Paul French researched every single streets of the International Settlement, the extra territorial road and the French Concession. Not only did he list them along with the matching current name, but most importantly he wrote an article about every one of them. As in previous books from French, this is the result of an extremely thorough research, that has already become an anchor for any Old Shanghai researcher. This is surely not one to reads from beginning to the end, but an extraordinary resource for research. To add to it, French also used part of his own collection of Old documents and photographs to illustrate the book. The only point I have found missing was a picture of the French Concession logo that would go next to the flag of the International Settlement. It seems that French forgot about the French. 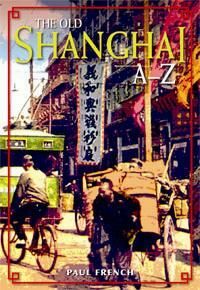 In any case, Shanghai A-Z makes a great Christmas gift for anybody interested in Old Shanghai. As always fascinating to read! 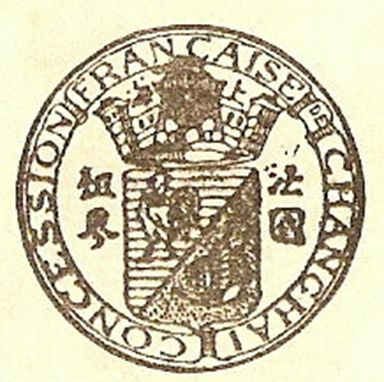 And Surprised to see the spelling of Shanghai in the French concession logo: CHANGHAI. Merci!